I am sure you have noticed that I have been missing from this blog and the blogging world in general for about a month now. I have missed blogging and baking and all of y’all! And I do want to thank each and everyone of you that have still been stopping by and reading Kitchen Concoctions and creating and being inspired by the recipes on here even in my absence. Thank you! You see this past month has been a tough one for my family and I. My brother-in-law, Eric’s brother, Joe passed away unexpectedly back in September. He was only 33 and had a heart condition that no one knew about. Eric was extremely close to Joe and there for I have become extremely close to Joe over the years. Understandably it as been a very hard time on everyone. And while I know Eric and his family know how much I love and care about them and how much Joe means to mean personally it was hard for me to verbalize these feelings to them at the time Joe passed away and even still a month later. I have never been good about sharing my feelings out loud but have always expressed myself through the written word. So I wanted to do something to remember Joe in my own special way and writing and cooking have always been things that bring me happiness and have always helped me. But because this is such a public blog and because I try to keep things light and funny on here I did not know if sharing this would be appropriate. However, I needed to do this. Joe was such a great guy and touched every person he came in contact with. He and a big heart, a big sprit, and a big personality. Joe helped me and cared about me, which was evident in several situations that I will never forget and I will forever be grateful for. Several people that I didn’t even know came up to me after he passed away saying that Joe used to talk so highly of me and how he was so happy his younger brother had such a great girl. Joe loved to eat and for someone who loved to cook this was a great thing! The very first Thanksgiving I made entirely by myself (from stuffing, to turkey, to dessert), I made for Eric and his brothers and cousins when our parents were all going to be out of town and we were ft to ‘fend for ourselves’. I wanted to create a recipe for especially for Joe. One of his favorite foods was chicken parmesan and mashed potatoes. We had many a dinners with Joe where Eric and I made these family favorites. And although Joe loved to eat he was a picky eater about a few things… Like he hated mayo, butter only on his sandwiches. And don’t even get him started on ranch! Joe also had many quirky sayings one being “choppin’ broccoli” (which he also hated). 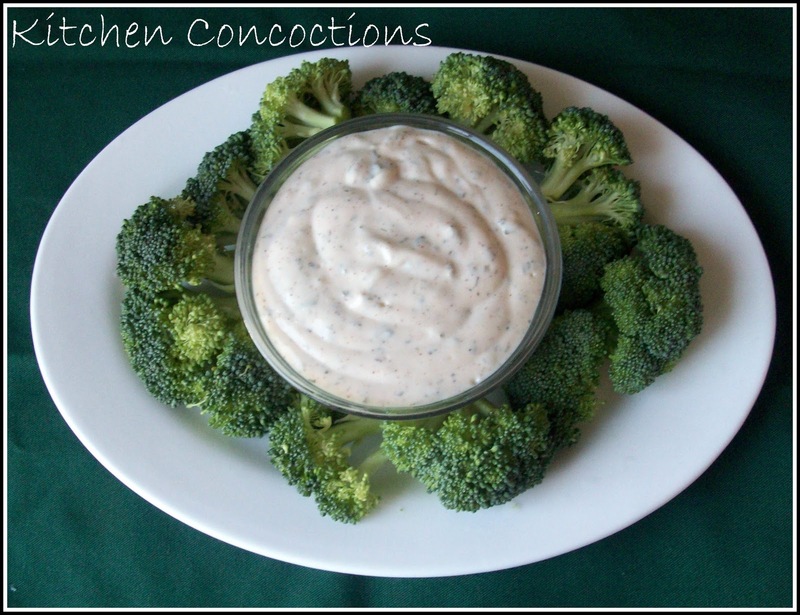 So in honor of Joe and to keep these funny memories alive, I am sharing a ranch dressing made in honor of Joe with broccoli florets for dipping. Joe I hope you are having a good laugh about this one! We love you man! Mince the garlic with a knife and then sprinkle ¼ teaspoons of salt on it and mash it into a paste with a fork. In a bowl combine the dried herbs and spices to the garlic. Add all of the remaining ingredients whisking together to incorporate. Taste and adjusting seasonings as needed. 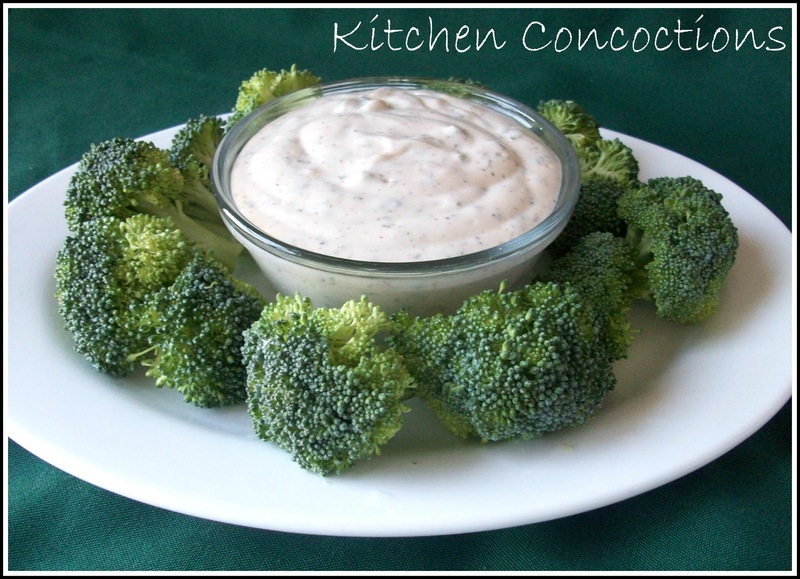 Serve with chopped broccoli, carrots, or veggies of your choice, or with a salad or hot wings. What a great way to show how you felt about him…through something you obviously have a deep love for. I think writing your feelings for anyone in the world to see is a great way to honor someone you loved. My sympathies.